Rochester Institute of Technology will play a key part in a new national consortium designed to help transform and bring innovations to U.S. manufacturing. As a core partner, RIT—through its Center for Integrated Manufacturing Studies (CIMS) and Golisano Institute for Sustainability (GIS)—will be part of the nation’s first Digital Manufacturing and Design Institute. Headquartered in Chicago, the digital institute has received a $70 million grant from the Department of Defense to become a regional hub of the National Network of Manufacturing Innovation (NNMI), envisioned by President Obama to serve as a network of independent, public-private manufacturing institutes. RIT is the only university in New York state to be a core partner in one of the three NNMI institutes announced to date. The grant from the Defense Department will be enhanced by commitments of $250 million from industry, academia, government and community partners, including the state of New York, effectively forming a $320 million institute. The initiative was formally announced on Tuesday, Feb. 25, during a White House ceremony led by President Obama. Nabil Nasr, associate provost and director of GIS, said RIT’s heritage in advanced manufacturing and research will play a key part in the consortium’s work. “We are excited about this new opportunity and this is a tremendous recognition of all the great work RIT’s Center for Integrated Manufacturing Studies and Golisano Institute for Sustainability have done in the past to support manufacturing in our region and the nation,” Raffaelle said. While designed to strengthen U.S. manufacturing, the new regional hub will also support improvements to Department of Defense effectiveness, including integration of design data across product lifecycles, reducing manufacturing costs and development time, and improving the “digital divide” with the overall supply base. CIMS will support the regional hub with expertise in several areas important to manufacturers and the Department of Defense. Digital manufacturing technologies will be applied to improve the effectiveness of remanufacturing and technology insertion as tools to extend the usefulness of Department of Defense assets, while reducing the cost of support. In addition, smart systems technologies will be applied to support real-time manufacturing equipment and process diagnostics and prognostics. Lastly, the experience at CIMS in advanced manufacturing integration will be applied to reducing product cycle time, particularly through the transition of advanced technologies to small and medium manufacturers. 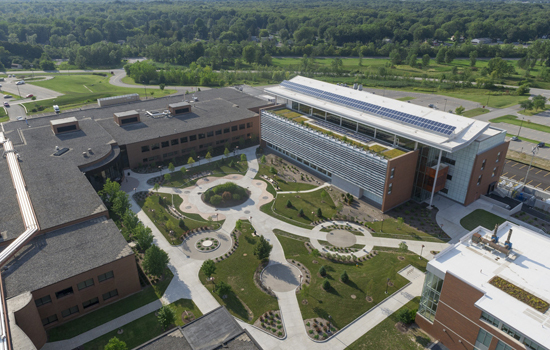 The Golisano Institute for Sustainability also houses New York state’s Center of Excellence in Sustainable Manufacturing, initially established two years ago. The center already enables expanded research and technology transfer activity between industry and RIT. The technology created by the center allows New York companies to compete more effectively in global markets as the environment for manufacturing competitiveness increases and the emphasis on sustainable manufacturing products and processes becomes more pervasive. Digital manufacturing is the use of an integrated, computer-based system comprised of simulation, 3D visualization, analytics and various collaboration tools to create product and manufacturing process definitions simultaneously. This latest investment is part of President Obama’s vision to reinvigorate U.S. manufacturing, creating new jobs and economic development, and spurring future innovation. The Digital Manufacturing and Design Institute, or Digital Lab, is an applied research institute that will both develop and demonstrate digital manufacturing technologies and deploy and commercialize these technologies across key manufacturing industries. Chicago’s UI LABS, where the consortium is headquartered, brings together 40 industry partners, and 30-plus academia, government and community partners, and additionally hundreds of supporting companies and organizations to create the Digital Lab. University and government partners are regionally anchored in the Midwest and extend to Oregon and Texas. Leading industry partners include General Electric, Rolls-Royce, Procter & Gamble, Dow, Lockheed Martin and Siemens. Core university partners include the University of Illinois, Northwestern University, Purdue University, University of Iowa, University of Nebraska, University of Chicago, University of Notre Dame and the University of Wisconsin. To learn more, go to http://digitallab.uilabs.org/. Officials from across the state are praising the key role Rochester Institute of Technology will play in the new national consortium on digital manufacturing. To read their responses, go to www.rit.edu/news/story.php?id=50578.